Ocean Beach, one of the gems of the San Francisco landscape, faces significant challenges. 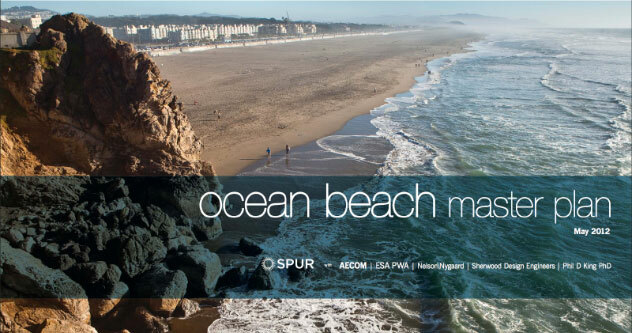 Since 2010, SPUR has led an extensive interagency and public process to develop the Ocean Beach Master Plan, a comprehensive vision to address sea level rise, protect infrastructure, restore coastal ecosystems and improve public access. The Ocean Beach Master Plan and Implementation Studies are made possible by the State Coastal Conservancy, the San Francisco Public Utilities Commission and the National Park Service. Ocean Beach Design document released. The Planning Commission opened discussion of the Local Coastal Program Amendments that will update city coastal policies for climate adaptation. City Agencies are carrying Ocean Beach Master Plan recommendations forward. Join SPUR and representatives from a host of federal, state, and local agencies at an Open House on April 19 to hear updates on the amendment to the Local Coastal Program. Coastal Sediment Managers have released a draft plan.